This example shows how to generate audio signals using a Session. This example uses, but does not require, a 5.1 channel sound system. In this example you generate an audio signal using the sound card on your computer using a 5.1 channel speaker setup. Before you begin, verify that your environment is set up so that you can generate data with your sound card. For more information refer to "Troubleshooting in Data Acquisition Toolbox". 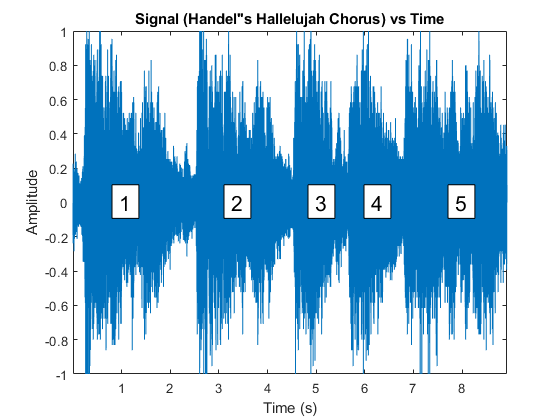 Load an audio file containing a sample of Handel's "Hallelujah Chorus." Plot data in order to identify five distinct segments. Each segment represents a "Hallelujah" in the chorus. The segments are annotated as 1 to 5. This example uses a 5.1 channel sound system with device ID 'Audio8'. 1. Create a session with directsound as the vendor and add an audio output channel to it. 2. Update the session rate to match the audio sampling rate. 3. Queue the same waveform to all available channels/speakers. If additional, different voices are available, these should be queued to the appropriate channels. 4. Start foreground generation. You should hear a sample of Handel's "Hallelujah Chorus." "Hallelujah" should be voiced five times, one for each segment depicted in the figure on all channels of the speaker system.